There’s a craft brewery in our neighborhood that has surprisingly good food. And by good, I mean amazing. In fact, Anguel & I might like their food even more than their beers...and as I write this, I realize that might be faux pas to admit out loud, but just being honest. One of our favorite items on the menu is a delicious Pulled Mushroom Banh Mi Sandwich. After our second time eating it - in the same week - we decided we needed to do something about it. 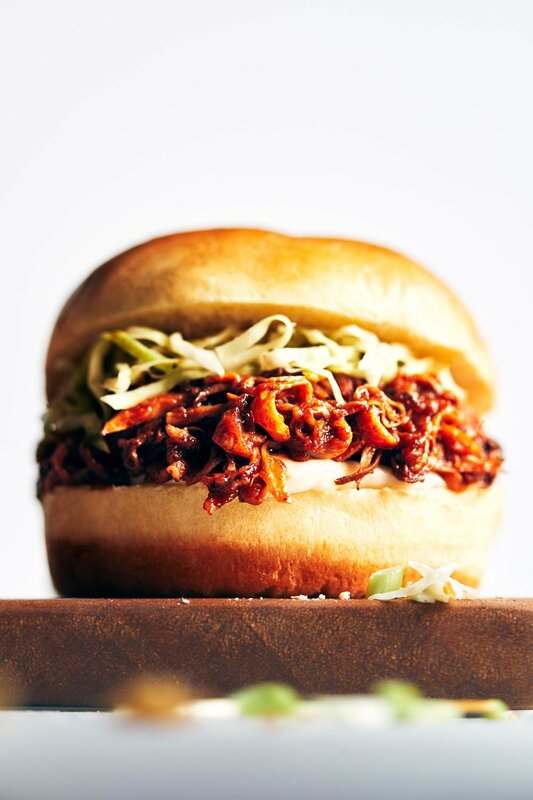 At home, we turned the pulled mushroom filling into a barbecue-sauce glazed “pulled pork” sandwich instead. Tucked in a super simple crunchy slaw, and called it a day. The combination is mouthwateringly good. But perhaps the best thing about it? Cooks in 30 minutes. This sandwich is for the days when you want something comforting and hearty (dare we say “meaty”). It’s not shy on flavor, and because it makes a pretty serious sandwich, you’ll probably want to roll up your sleeves. We especially love making it for guests. Not only can it be prepped in advance, but it’s always been a hit. When even your most meat-loving friends proclaim they “can’t believe it’s vegan” - as they mop up every last crumb - you know you’ve hit it out of the park. The trick to the “pulled pork” filling is to get your hands on King Oyster mushrooms. King Oyster mushrooms have thick stems, which when pulled apart with a fork, look surprisingly like pulled meat. If your local grocery store doesn’t stock them, Whole Foods usually does. Asian grocery stores almost always stock King Oyster mushrooms, and this is usually where you’ll score the best deals. If you’re lucky you can find them loose (i.e. not in packaging); otherwise check the pre-portioned containers of mushrooms. Don’t be surprised if it seems like a lot of mushrooms at the start. They shrink down significantly when cooked, and you don’t want to be short on filling. When it comes to cooking, it’s important to give your shredded mushrooms enough time to sear in the pan. If you have a cast iron skillet pan, it’s time to whip it out. In any case, avoid over-stirring the mushrooms so they can get a good sear on each side. You’ll notice the ingredient list is short for the filling (hurray!). Tamari (or soy sauce) is one of our most-used flavoring hacks when it comes to mushrooms. It infuses a savory, salty flavor into mushrooms that’s down right delicious. Then, all it takes is just a couple spices, and a sticky barbecue sauce to infuse the rest of the flavor. We really like to use our Healthier Homemade Barbecue Sauce for this one, and strongly encourage you to give it a try. It’s naturally sweetened and devoid of a ton of added junk that most store-bought barbecue sauce are loaded with (like heaps of refined sugar, preservatives, smoke, etc.). To save yourself time, make the barbecue sauce in advance. But this is a judgement free zone, so if you want to go the store-bought route, you do you. The rest of the sandwich comes together in a flash. While the mushrooms are searing on the pan, you can multitask and whip up the slaw. You can even toast the buns, if you wish. Then lay out lots of napkins, because you’ll probably need them! Use a knife to remove the tops of the mushrooms. Slice/mince the tops as thinly as possible. The tops don’t “shred” like the stem of the mushrooms, so this is a no-waste way to incorporate them into the filling. Set aside the minced tops. Now, use a fork and rake it down the base of the mushroom stems. The mushroom stems should shred. Continue doing this until the remaining mushrooms are shredded. Heat a heavy skillet pan (ideally cast iron) over high heat. Add 1 tablespoon oil. Once hot, add the mushrooms. Use a heat-proof spatula/flipper to press the mushrooms into a single layer, maximizing the surface area in contact with the hot pan. Leave the mushrooms undisturbed for 10 minutes to sear thoroughly. Flip the mushrooms, and allow the other sides to cook for an additional 5 minutes. Add tamari/soy sauce, then stir to coat the mushrooms. Let the mushrooms cook for another 5 minutes. Reduce heat to medium-high, then add smoked paprika and garlic powder. Cook mushrooms for another 5 minutes. Mushrooms should now be golden brown with some crispy edges. Add barbecue sauce and stir thoroughly. Heat for 3-5 minutes until the sauce is sticky and warm. Serve hot, with buns (toasted, if desired) and cabbage slaw. 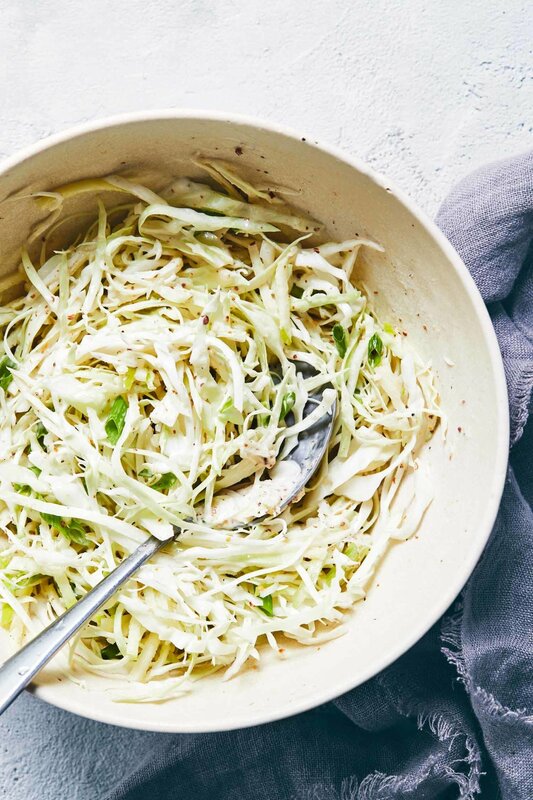 In a bowl mix together shredded cabbage, green apple, green onion, mayonnaise, apple cider vinegar and grainy mustard. Toss to mix well. Season with salt and pepper to taste, then serve. -*For those needing gluten-free, ensure you’re using a certified gluten-free tamari. -**You can substitute with an equal amount of store-bought barbecue sauce, but if you go this route, be prepared to adjust the smoked paprika & garlic powder seasonings. Every store-bought sauce is slightly different in flavor, and most have liquid smoke added (which could be too much when combined with smoked paprika). Simply hold off on the spices until you add the store-bought sauce. Then taste, and add in spices as needed.